Nations Press health Study Reveals Mixing Ginger And Chili Creates A Powerful Combination AGAINST DEADLY CANCER!! 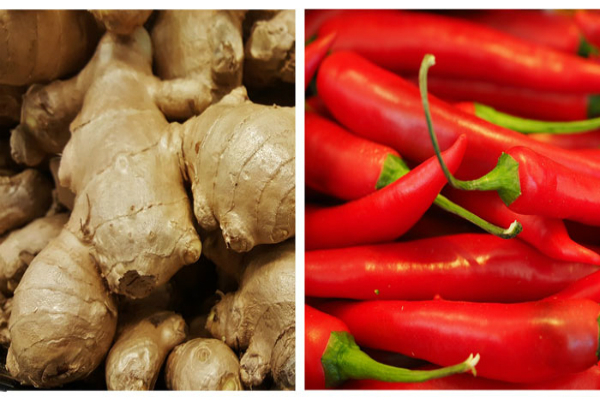 Study Reveals Mixing Ginger And Chili Creates A Powerful Combination AGAINST DEADLY CANCER!! SPONSORED LINKS We have no idea that some spices can have different uses and can treat diseases effectively, Good to know that this spices are very common to our kitchen, the ginger and chili. A recent study has found that the popular spices have properties that significantly reduce mice’s chances of developing lung cancer due to their ability to bind to a receptor that is also responsible for tumor growth. According to a study now published in the online Journal of Agricultural And Food Chemistry, capsaicin, a compound in chili peppers, and 6-gingerol, a component in ginger, could work together to lower the risk of cancer, possibly because 6-gingergol binds to capsaicin to form a super-strong compound that inhibits key tumor-growing receptors, The Daily Mail reported. While ginger and chili may have cancer-kicking abilities together, on their own, the two spices are also impressively powerful. For example, ginger contains chromium, magnesium, and zinc, which help to maintain healthy and normal blood flow. In addition, The American Pregnancy Association recommends consuming ginger in different forms, such as tea or jam, to help curb morning nausea brought on by pregnancy, and Columbia University researchers say that ginger, paired with bronchodilating medications, maybe help to relax the smooth muscle surrounding airways. As for chili, capsaicin, the same compound that gives chili peppers their hot flavor, also inhibits a brain pain transmitter which can help to reduce headaches and prevent inflammation. In addition, Chili pepper contains 108 percent of the vitamin C daily requirements per tablespoon, which can help to improve the immune system.